Draglam Salt is proud to provide the salt you need to keep roads clear and people safe. Despite consistent precipitation in January, back-to-back winter storms in February, and an industry-wide salt shortage, Draglam Salt’s supply has remained plentiful. We are steadfast in our ability to supply bulk and bagged rock salt to our valued customers. As a result of diligent planning, we have been able to maintain a consistent pick-up list price for the past several months. After more than 27 years in business, we continue to be humbled by the power of mother nature. While these winter weather patterns are natural, the immense liability placed on snowplow and landscape contractors is not. Salt is the most widely used tool for managing snow and ice on roads, parking lots and sidewalks; the expectation of “black top” in recent years has substantially increased demand for rock salt, quickly depleting local supply. This increased demand could only be met by careful supply management and a dedication to support our customers with the deicing product they need, when they need it. At Draglam Salt, our focus remains clear: to provide quality deicing products and reliable service to the private contracting industry. As a leading distributer of bulk salt, we do not compete with our landscaping and snowplowing customers, but rather support their product requirements so they can fulfill their contracts as efficiently and economically as possible. We strive to be Southern Ontario’s most reliable source for bulk salt, at the most competitive price. By carefully monitoring inventory levels and strategically allocating salt supply, Draglam Salt was able to fulfill its customer commitments. This inventory management also ensures that in the event of an unexpected spring ice storm, we’re ready to serve. This winter has reinforced the importance of thoughtful planning and preparation in order to maintain our reliability as your trusted salt supplier. We are thankful to our customers for putting their trust in us to fulfill their salt and deicing needs, and look forward to another exciting season. The aggregate industry is responsible for providing over 20,000 jobs as well as contributing $1.4 billion to Ontario’s economy yearly. With this recent announcement, the Ontario Government has committed itself to ensuring the continued health of this essential economic driver. As a part of this announcement, the Summit of Aggregate Reform will be held on March 29th as a forum encouraging dialogue and greater cooperation between industry stakeholders and government officials. A new permit has also been granted for Brock Aggregates to build a structure in King City, another step toward ensuring economic stability through growth and job creation. We are proud of both our contribution to Ontario’s economy as well as our role as a leading provider of the raw materials essential to building schools, hospitals and bridges. We look forward to continuing to strengthen our province’s economy and infrastructure while working alongside the Ontario Government. G&L Was Proud to be Back as the 2019 Presenting Sponsor at the Landscape Ontario Awards of Excellence. 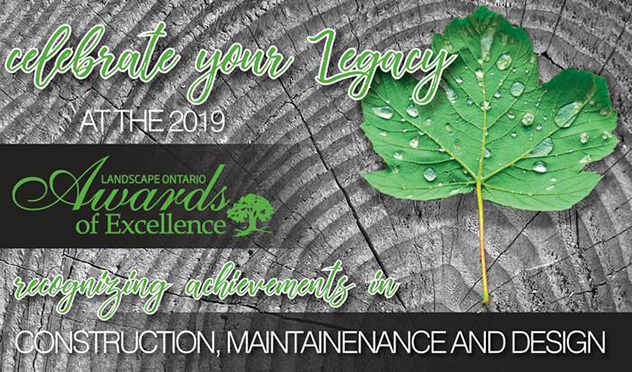 G&L was proud to be back again as the 2019 Presenting Sponsor at the Landscape Ontario Awards of Excellence. This is an annual juried competition that recognizes breathtaking design and master craftsmanship in the landscape construction and maintenance industry. This year’s awards took place on January 8th with this year’s theme of Legacy. Recognizing great work and serving to inspire, the Landscape Ontario Awards of Excellence also stir the competitive spirit and stimulate advancement, achievement and improvement, raising the bar for the industry. In keeping with the night’s theme, G&L returned to tried and true and gave away a one-week stay at a luxury condo in Mt. Tremblant, Quebec. Congratulations to the lucky winner, Josh, of Twenty Creek Landscaping.